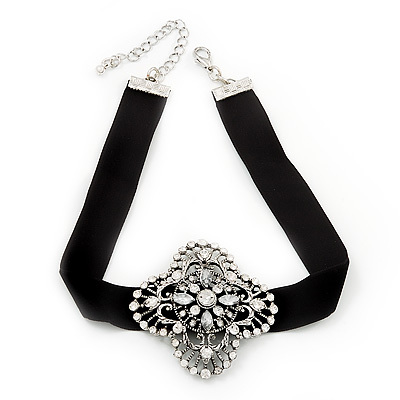 Add a touch of dramatic styling to your outfit with this fashionable Black Velour Ribbon Diamante Filigree Cross Choker. Featuring a choker design, made of a black velour ribbon and decorated with a large diamante, filigree cross in silver tone metal. The necklace measures about 29cm in length with 7cm extension and 2cm in width, fastens with a silver-tone lobster-claw clasp for a reliable fit. The central cross measures about 5.5cm in diameter. Such an eye-catching accessory for your day and evening wear.